Voicent’s 2-way text message solution is powerful and flexible to handle most situations. 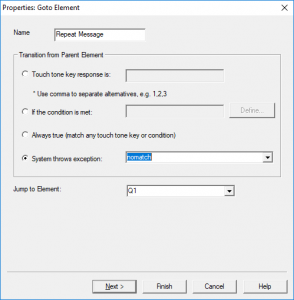 For general information, please take a look at the article How to manage incoming text message. When you use our cloud service, the text message feature comes with a dedicated phone number. Customers can text you any time. Based on your settings, these incoming text can be handled by auto responders automatically, or forwarded to a particular agent/user. If there is a new text message, the agent will see a notification in the top status bar. He can then read the message and respond to it manually. All these are done in a web browser window. If a cell phone is used to login to your Voicent account, you can respond to these messages the same way as you do on a computer. (The text message is sent from your account, not from your cell phone company). Though we do not support these devices, you may still be able to get it working with the right modem. To help customers who still want to use these devices, the following is the list we use internally to troubleshoot the device. 1. Plugin the SIM card to your modem. Please make sure the size fit. If not, you can always ask your mobile company change it to a different size. 2. The first time you plugin the modem to your computer, it should install the modem software automatically. 3. Most modem should show a green light if the modem is recognized by your computer. 4. Run the modem software (not Voicent software) and you should be able to send and receive text messages. If you cannot find the software to send text messages, then your modem may not support the text interface. If you cannot see from the modem software that it is connected (you should see signal strength bars like you see on your cell phone). Check the modem software is set to 3G or 4G. Some older modem only support 2G network, these modems are not going to work. 5. If the modem software is running, make sure it is fully exited. (check windows task bar’s notification area and make sure there is no modem software icon in running status). 6. Open Voicent app, go to Setup, Options, SMS tab. Make sure Auto Detect is selected. Click OK. The app should restart. If not, click the Start button. 7. If the modem is detected by the software, you should see SMS line started. You can check the message from System Status icon. The new survey designer is actually pretty powerful. As long as your app does not require back end integration (database, website, email etc. ), it can pretty much define any interactive apps. This article explains how to handle branches in an IVR app. 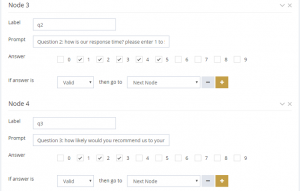 For incoming survey, you could use auto responder definite to trigger different surveys. For example, the following figure shows to trigger Agent1 Survey when the incoming text is “001″ and Agent2 Survey when it is “002″. 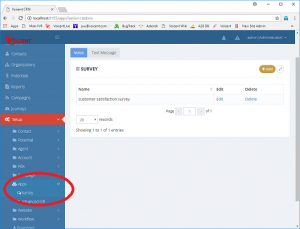 Using exactly the same method, you can define a multi-language text survey app. 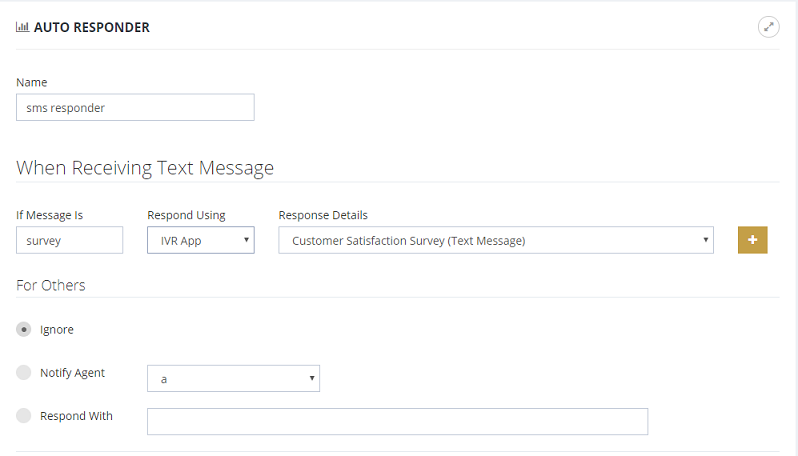 The survey app defined in the previous article can also be used for inbound text message survey. To do so, simply go to Setup, PBX, SMS app, select the Add button to add a new auto responder. 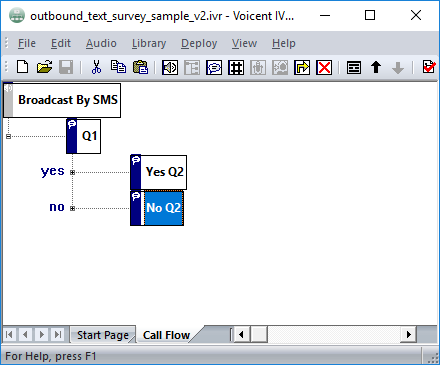 In the figure, the “When receiving text message” section basically defines the survey should be triggered whenever there is an incoming text message “survey”. Save the auto responder. Now, you can select the new auto responder for incoming text. Go to Setup, PBX, SMS app, select the Edit button. Now, send message “survey” to your text number to start the survey. The new survey app designer handles invalid input automatically. The default action is to repeat the node up till the max retry time. In the Error Handling Options section, you can specify additional message to send when an error occurs. You can also define the max retry time. If additional message is specified for error handling, then it is sent before the node is retried. The generic error handling applies to all nodes. This is normally enough for most applications. If you would like to handle errors differently, you can add conditions in the node itself. For example, the following figure shows how to simply exit the survey if an answer is invalid. 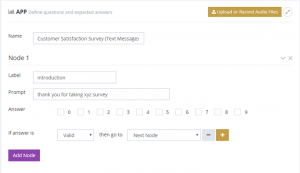 In this article, we introduce the new survey app designer through the following sample survey. Introduction: thank you for taking our xyz survey. Question 1: how would you rate your overall experience? please enter 1 to 5, with 5 being the most satisfactory. Question 2: how is our response time? please enter 1 to 5, with 5 being the fastest. Question 3: how likely would you recommend us to your friends? please enter 1 to 3, with 3 being most likely. End: Thank you for taking the time to finish the survey. Under the label of Node 1, enter a label like introduction and enter the introduction for the prompt. Leave all numbers under the Answer section unchecked. When no answer is selected, the system sends the message listed in the prompt section, and move on to the next node. Click the Add Node button to add a Node 2 section. Enter the information as follows. Select expected answers 1 to 5 in the Answer section. When some answers are selected, the system sends the prompt and then waits for text message response. Add two more nodes for question 2 and question 3. Then add a thank you node similar to the introduction node. Click the Save button at the bottom to save the survey app. To start a campaign using this survey app, select from the main menu Campaigns, click the Text Broadcast button. 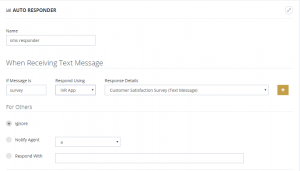 In step 2, select Simple Survey as the message type. Finish the rest of the steps to start the campaign. In the upcoming 10.8.2 release, a new survey app designer is introduced to reduce the complexity of creating most survey applications. 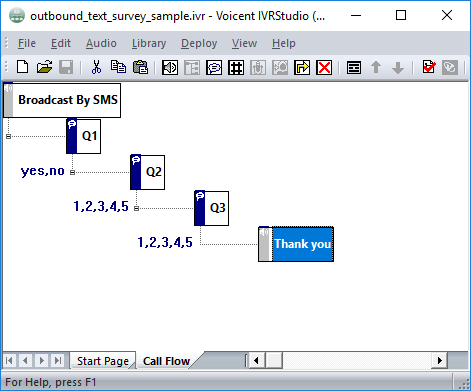 In previous releases, any interactions involve multiple questions require using Voicent IVR Studio, which is a full developers tool with support for database access, email and website and integrations. Though the tool is not that difficult to use, but it does require some learning time. However, many survey applications do not need the full back end programming support. The new survey app designer eliminate the need for the additional tool, thus greatly reduces the complexity. The interface is intuitive and requires almost no learning. If you are using our cloud platform, the new designer is available in the basic subscription plan. 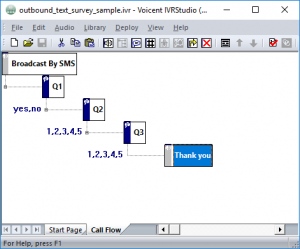 If you use our on-premise software, you would need IVR Studio license. The survey app designer can be accessed from the main menu under Setup, Apps, Survey Etc.. The designer works for voice survey and text message survey. To add text message survey, click the Text Message button. 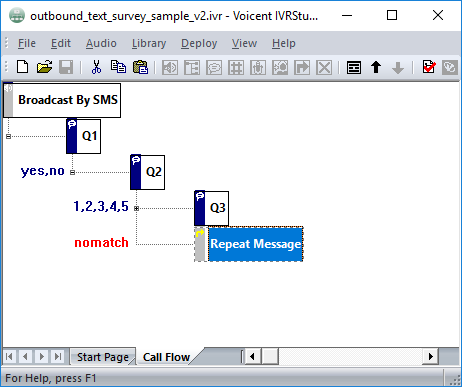 Voicent cloud service has integrated text message service. There is a per text charge when using our service. 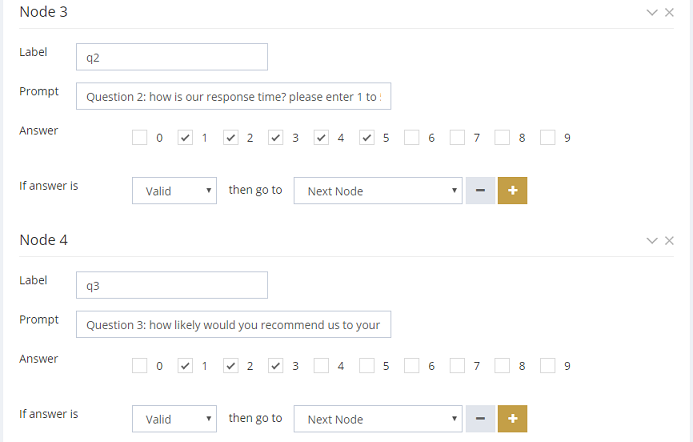 When you design a text survey with a few questions and answers, how is the per text charge apply? The per text charge is applied the same way your cell phone company charge for text. When you send a question, it counts as one text. When you receive an answer, it counts as one. So if you have a survey that have 5 questions and assume your customer answers all questions, you will have 10 text messages in total. Also, please note long text message (more than 160 characters) will be charged more. For more details, please see the FAQ on our cloud pricing page.